This has been a busy fall, keeping up with the new herbal medicine course for veterinarians that I am co-teaching in the Outerbanks, North Carolina, as well as lecturing this month at the IAAHPC (International Animal Hospice and Palliative Care) annual meeting. The new textbook was well-received and the first students in the Animal Hospice and Palliative Care Certification Program (100+ hours) completed our graduation, adding more certification letters to keep track of! It is a relief to have this certification completed and it was such a valuable learning experience to share the knowledge of many experts on topics including pain management, recognition and palliation of clinical signs of discomfort in animals, progression and prognosis of various diseases including cancers and organ failure, holistic and integrative approaches to treatment, the normal processes of death including euthanasia, and additionally all of the important aspects of after care, memorialization and grief that accompany end-of-life care for our animals. We all have different needs when it comes time to say goodbye to our beloved animal companions. I make an effort to approach this time with flexibility, compassion, and understanding to help families provide the best possible care in any given situation. One of the most valuable things that I can provide is extra time to think things through, during home visits and with additional comfort care for the animals. For more information on end-of-life services, click here or contact me. New Animal Hospice and Palliative Care Textbook! Over the past year, I have had the honor of writing a few chapters in the newly published textbook: Hospice and Palliative Care for Companion Animals, as well as contributing to the first offering of the IAAHPC Animal Hospice and Palliative Care Certification Program, a combination of online and in-person training for veterinarians and veterinary technicians on topics from philosophical and ethical considerations in animal end-of-life care, quality of life considerations and the technical aspects of offering palliative care ("comfort care") to animals in their last days weeks and months. This is a relatively new field in veterinary medicine and it has been a pleasure to work with the caring individuals involved in developing educational materials and information for professional providers and caregiving families. The beauty of this care is that sometimes animals, just like people, actually live longer than expected when care is focused on comfort and the enjoyment of the life that is still present. There are many considerations to weigh when faced with terminal illness including prognosis and the possibility of cure. I find these discussions are best approached in the home, involving the whole family, and with multiple visits as we monitor changes and different needs and questions that arise. Please contact me if you would like more information or to schedule an in-home palliative care consultation for your animal. Although here in Iowa we are still fluctuating between summer and winter temperatures, spring will get here soon! It is time to be sure heartworm preventative medications are on hand along with any flea and tick preventatives as needed for your animals' exposures. And Lyme Disease seems to be becoming more prevalent as well. The best preventative is keeping the ticks that spread it away. It is surprising how tiny these ticks are—the size of a poppy seed, so really hard to find in dog fur! I am often asked if there are more "natural," non-chemical or non-toxic products that can be used to keep these parasites away. Unfortunately, and this is a consensus among most of the herbal veterinarians I know, nothing works as well and as quickly as the pharmaceutical products for flea, tick and heart worm prevention. Many of these pharmaceutical products are very low dose and I do have some favorites for that reason. Herbs and essential oils that are anti-parasitic can quickly move into the more toxic realm depending on dosage and use. Herbs are not chemical-free, they are made up of plant chemicals (phytochemicals) which are the sources of many pharmaceutical medicines. Many phytochemicals are extremely helpful, some can be toxic. It is important to learn the difference, which is why I have spent so much time studying them! Some essential oils can be used safely in dogs for flea and tick prevention—they need to be applied multiple times a day, but in a very dilute form and long term use in animals with a such sensitive noses may cause their own problems. Many of my clients, including myself, do not have the time and/or memory to spray their dog multiple times a day. Cats, with their different liver metabolism, are especially sensitive to essential oils and I am cautious about dogs with any liver problems as well. I'm glad there are options. Learning the natural cycles of the insects throughout the day can help with avoidance, but is not foolproof. Those insects do not always follow the rules. For example, mosquitoes which spread heart worm disease are generally more active during dawn and dusk, but can also be quite active in cool moist areas any time of the day. Heart worm is such an awful disease, I really don't recommend risking it. Ticks tend to hang out in tall grass waiting for their victims to walk by. They are also much more prevalent in the spring, but again they can really be around any time the weather is above freezing. I hear having chickens in the yard is a great way to keep tick populations down! I do my best to help people minimize toxic chemical exposures and reduce the amount needed by only treating during the active seasons. Feel free to contact me if you'd like a longer discussion on these important issues. No, that's not some new text slang I learned from my teenagers! 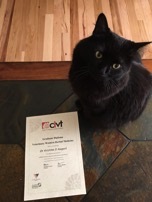 After quite a long haul working toward this degree, I have completed my Graduate Diploma of Veterinary Western Herbal Medicine (GDVWHM) through the College of Integrative Therapies (CIVT). This was an intensive course working through botanical identification, chemical composition, traditional uses as well as scientifically verified medicinal actions, adverse reactions, herbal medicine making, quality control, and much more. My final research project was a paper on herbal medicines for use in animal hospice and palliative care, joining two of the most important aspects of my veterinary services. One of my biggest take-away findings in writing this paper is that just about every medicinal plant that we use has antioxidant and anti-inflammatory properties to some degree. This makes sense as the plants use these qualities for their own healing and self-preservation. Many of these plants are used as food and teas and can be added into the diets of our animals for gentle support. There are most certainly times when stronger medicines are needed and I definitely advocate for addressing any distressing clinical signs such as pain, nausea and other concerns with appropriate and timely treatments with pharmaceutical drugs. This is why I like the term "integrative medicine" where we can integrate multiple aspects of care for each individual patient. I am very much looking forward to spring, planting my herb garden and getting to know the plants even better!